I absolutely hate losing things. I am still plagued by the Lion King watch I lost in the girl’s locker room in fourth grade. Similarly, I lost a black skirt that my mom bought me freshman year of high school to wear to my choir concerts. I’d be lying if I said I didn’t sometimes replay those instances over and over in my head, trying to figure out how these items disappeared. More recently, it was a stack of recipes I’d ripped out from magazines along with some handwritten pages of recipes I’d copied down while home at my parents’ house. I used them to meal plan on the trip back to St. Louis, remember sticking them in something, and unpacking that evening, only to find them nowhere to be found. I have searched every pocket and every bag but they have yet to appear. What does that have to do with this salad? 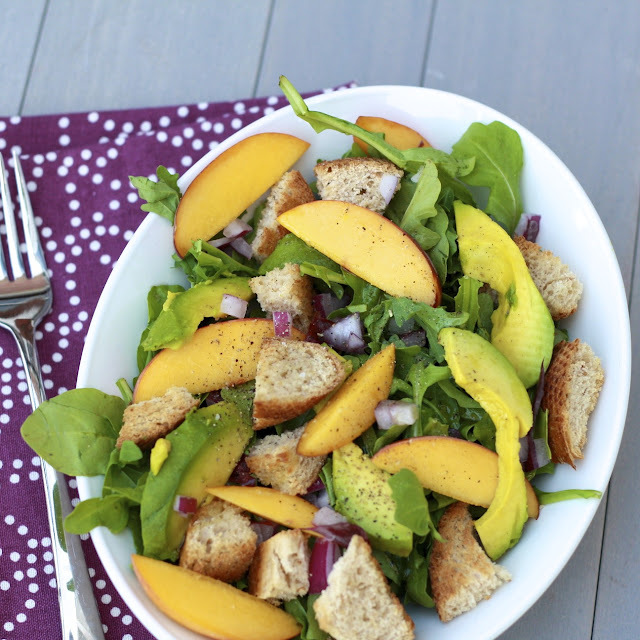 One of the pages I’d ripped out and brought home included a peach panzanella salad. When I realized I no longer had the recipe, I decided to move forward with the recipe anyway. I had a vague memory of the ingredients it mentioned (it was more of a salad description than a straight-forward recipe) and decided to recreate it as best I could. I’m pretty certain that I came close to the original, and if not, I was perfectly satisfied with this version! This salad manages to beautifully bring together an array of tastes and textures. There are creamy avocado, crunchy homemade croutons, tangy vinegar, and peppery arugula. The sweet, juicy peaches are the icing on the cake, if you will! This made two large salads—a perfect summer meal in our house—but you could easily up the ingredient amounts to serve a larger crowd and make this more of a side dish than a main. This would also be good with some prosciutto or grilled chicken in there if you want a little more protein. I’m still hoping to uncover the other recipes (and, if we’re being honest, that Lion King watch and black skirt! ), but at least I can take solace in one good thing that resulted from the loss! 1. Put bread cubes on a baking sheet and bake for 10-15 minutes at 400F, until toasted. 2. Divide arugula amongst bowls. 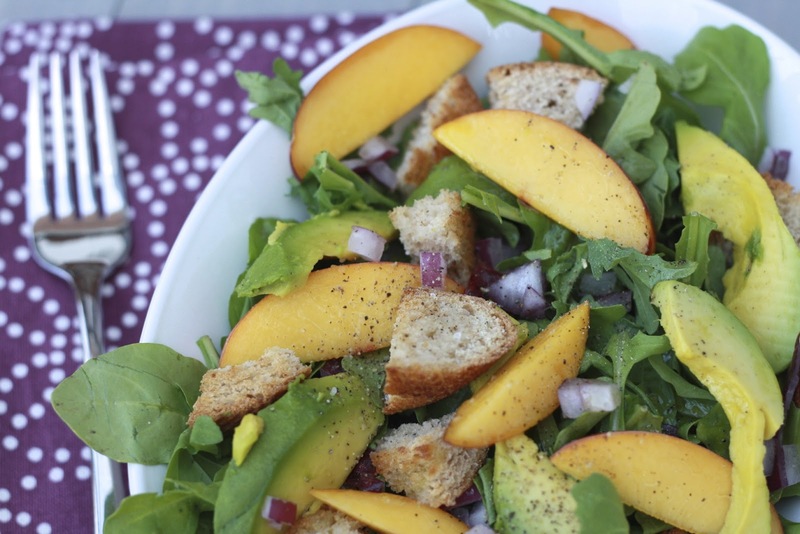 Add avocado, peaches, red onion, and bread cubes. 3. Drizzle with olive oil and white balsamic vinegar. Season with salt and pepper, to taste.